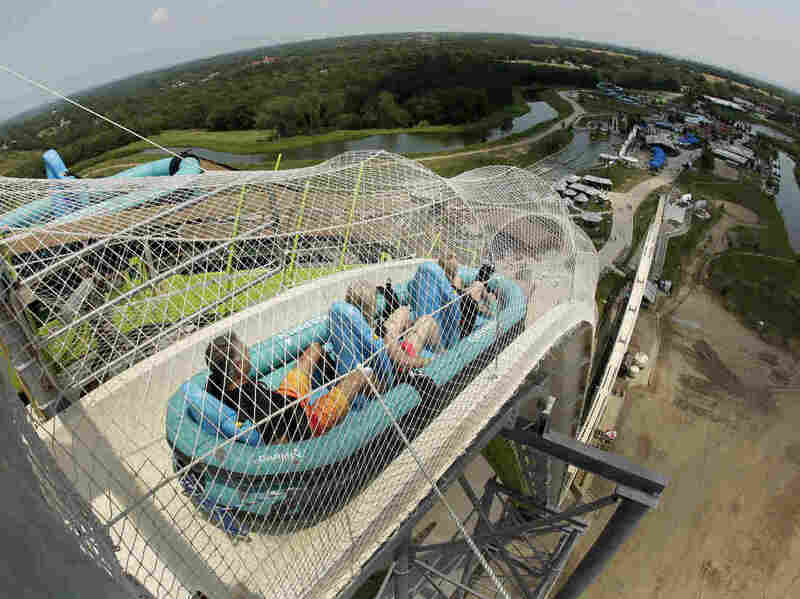 Court Grants Permission To Destroy World's Tallest Waterslide Nearly two years after the gruesome death of a 10-year-old boy on the Verruckt, a judge has ruled it is time to tear down the 17-story structure. A Wyandotte County, Kan., court judge has granted permission for the Verruckt waterslide to be torn down. Park officials said it would be demolished shortly after Labor Day. The now infamous Verruckt waterslide — billed as the tallest in the world — is expected to be demolished shortly after Labor Day, after a Wyandotte County, Kan., judge granted the amusement park company permission to tear it down. Ten-year-old Caleb Thomas Schwab was decapitated and two women were seriously injured riding the 17-story waterslide at Schlitterbahn Waterpark in Kansas City, Kan., in August 2016 — just 18 months after the amusement park ride debuted. It has remained closed ever since. Court orders blocked the company from dismantling the ride while officials investigated. "The court has granted approval to take down the ride," Schlitterbahn Waterparks & Resorts announced in a curt Facebook post on Thursday. Winter Prosapio, the amusement park company's corporate director of communications, told NPR the announcement was made at a court hearing on Thursday involving several employees who face criminal charges. "This is something we've been waiting to do but we needed the court to decide when," she said, noting that the company's decision to destroy the slide was made in November 2016. Melanie Morgan, who is representing KC Waterpark Management LLC, an affiliated corporate entity of Schlitterbahn, told the Kansas City Star that dismantling the 168-foot slide is a "fairly complicated" process and is expected to take three weeks. Verruckt — the German word for insane — was conceived in 2012 and was plagued by a series of design problems that pushed back its 2014 grand opening by about two months. Riders strapped into a multiperson raft careered down the slide at speeds up to 70 mph. The trip down included two plunging drops that descended into a pool at the end. "Ultimately, it was the ride's tendency to send riders aloft that led to the death of Schwab, son of Kansas state Rep. Scott Schwab. The raft the boy had been riding with two adult women flew into the waterslide's overhead hoops and netting, killing the boy and badly injuring the women who survived the incident." "As a family continuing to heal, we welcome the decision of the court today," Scott Schwab said in a statement, according to the Star. "This is an important step to our family and believe it is to this community as well."